On Day 256, after a nice long workout, I took a military shower as the thing I'd never done before. 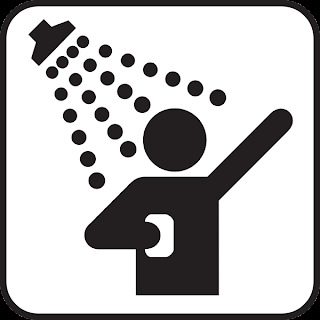 A military shower is simply turning off the water while soaping, shampooing, shaving, etc. Environmentalists encourage individuals to take military showers to save water. According to Brighter Planet website, taking a shower this way could cut water usage during a shower from 17 gallons to five gallons. Who knew taking a regular shower required 17 gallons of water? Shocking! I hopped in the shower, turned the water on and off while taking care of all of my shower chores. I wet my hair, then turned the water off. Shampooed, then turned the water on. Water off for the conditioner, on again to rinse. It was a little chilly when the water wasn't on, and I definitely didn't want to stay in there and hang out. But after a few minutes, I was clean and my shower was over. Since I tried the military shower in the summertime, I wasn't ever terribly uncomfortable. I probably won't be enjoying military showers in the winter, however, since my apartment feels like an igloo and standing under hot water is one of my favorite wintertime activities. I have no idea if people in the military are required to shower in this fashion, or if because they're thrown into one big room all together they choose to shower this way so they can get the hell out of there. Regardless, military showers are an easy way to conserve water, and I will definitely take one again.